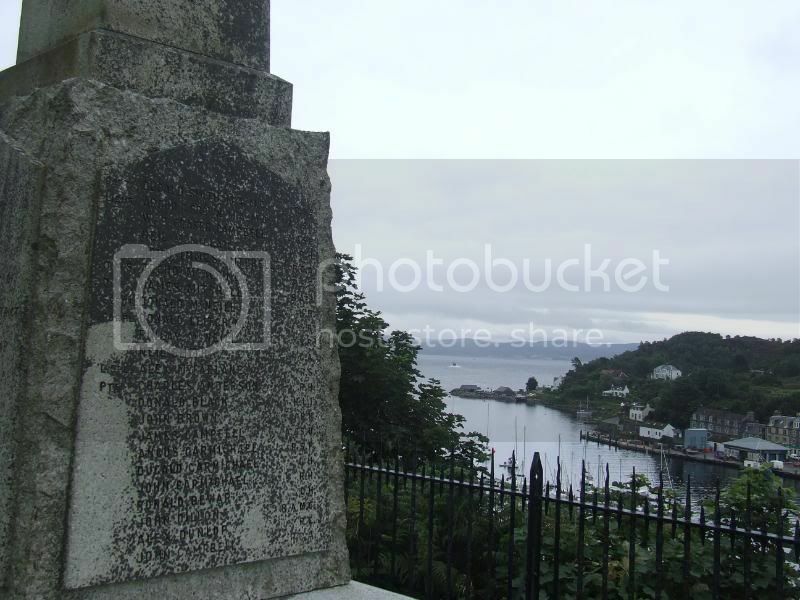 The Tarbert memorial overlooking the fishing village on Loch Fyne. The grey granite obelisk stands on a tapering pedestal and low rustic granit base and is by Glasgow monumental sculptors Scott Rae. According to the inscription at the front it was unveiled by Lady Campbell on the 6th August 1921. 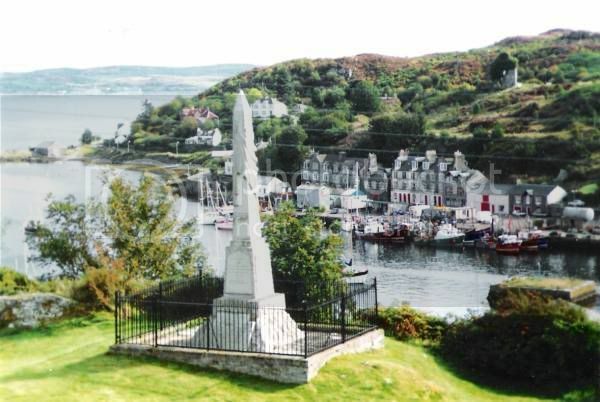 Fishing villages often have their war memorials sited on top of a local hill were they are visible from the sea and can provide the fishermen with an accurate bearing when navigating their boats home, a nice and fitting idea for a memorial. 'Order No. 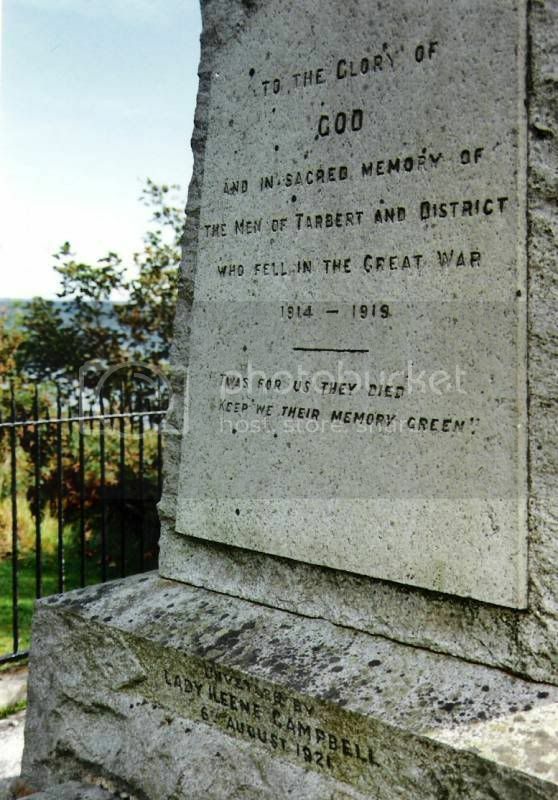 5500, Tarbert, Grey obelisk, Erected June 1921, Daybok 329'. 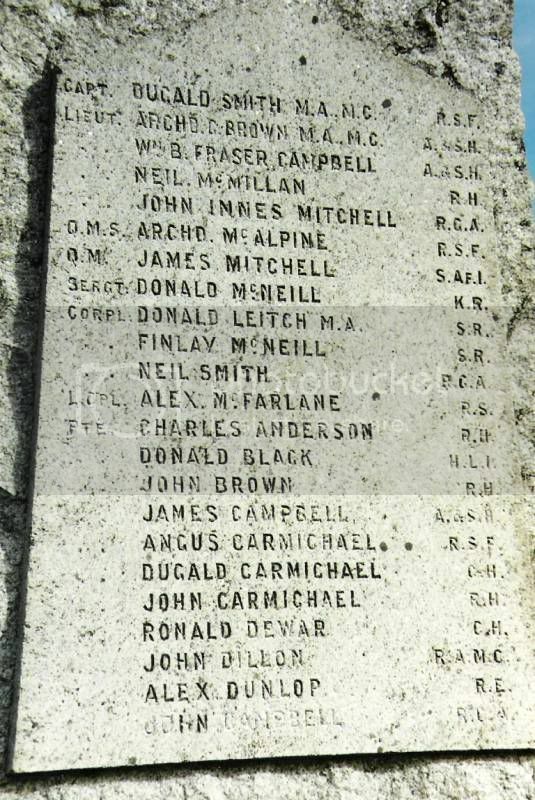 Brown Archibald G.	Argyle & Sutherland Highlanders	Lieutenant	M.A. M.C. Carmichael Dugald	Gordon Highlanders	Private	Cameron Highlanders? Dewar Ronald	Cameron Highlanders	Private	Gordon Highlanders? Gillies William	Argyle & Sutherland Highlanders	Private	M.M. Leitch Donald	S.R. Corporal	M.A. 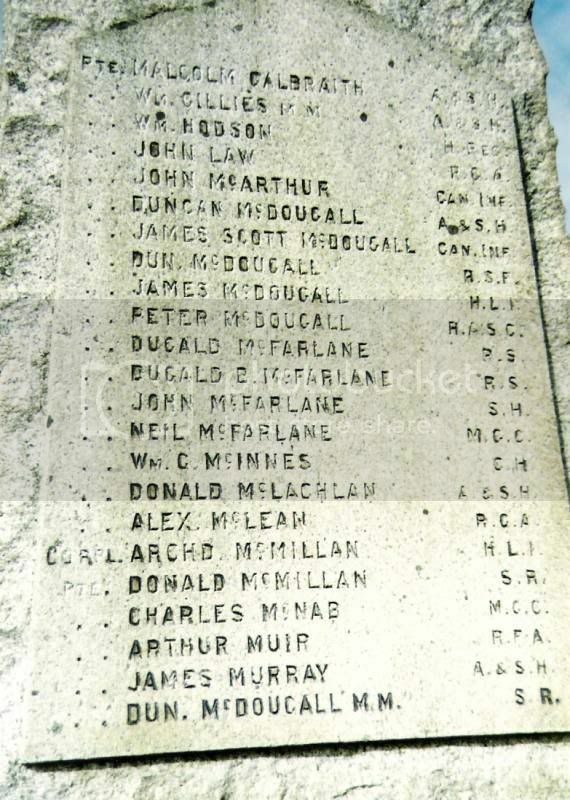 McAlpine Archibald	Royal Scots Fusiliers	Q.M.S. McDougall Duncan	S.R. Private	M.M. McInnes William G.	Gordon Highlanders	Private	Cameron Highlanders? Mitchell James	South Africans	Q.M. Smith Dugald	Royal Scots Fusiliers	Captain	M.A. M.C. McDougall James	Merchant Navy	Purser? McDougall John	Royal Artillery	? McIntyre Donald C.	Royal Air Force	Sergeant N/D? McKee John	Merchant Navy	Radio Officer? On a quiet sunny Sunday morning in late Spring this is one of the finest places on Earth. A very good place for a memorial. CAPT. DUGALD SMITH M.A. M.C. R.F.A. LIEUT. ARCHD. C. BROWN M.A. M.C. A. & S.H. LIEUT. W. B. FRASER CAMPBELL. A. & S.H. LIEUT. JOHN INNES MITCHELL	R.G.A. CORPL. DONALD LEITCH M.A. S.R. PTE. MALCOLM GALBRAITH	A. & S.H. PTE. WM. GILLIES M.M. A. & S.H. PTE. JOHN McARTHUR	CAN. INF. PTE. DUNCAN McDOUGALL	A. & S.H. PTE. JAMES SCOTT McDOUGALL	CAN. INF. PTE. DOUGALD B. McFARLANE	R.S. PTE. DONALD McLACHLAN	A. & S.H. PTE. JAMES MURRAY	A. & S.H. PTE. DUN. McDOUGALL M.M. S.R. PTE. ARCHD. E. PRINGLE	A. & S.H. PTE. JOHN SINCLAIR	AUST. F.
PTE. ARCHD. SMITH	B. REG. PTE. CHARLES TOWNSLEY	A. & S.H. PTE. GEORGE WILLIAMSON	A. & S.H. GUNNER	DUNCAN CAMPBELL	MERC. MAR. PETT. OFFR. DUNCAN KERR	MERC. MAR. SEAMAN	JAMES KERR	MERC. MAR. SEC. OFFR. HUGH McFARLANE	MERC. MAR. SEAMAN	ALEX McGUGAN	MERC. MAR. 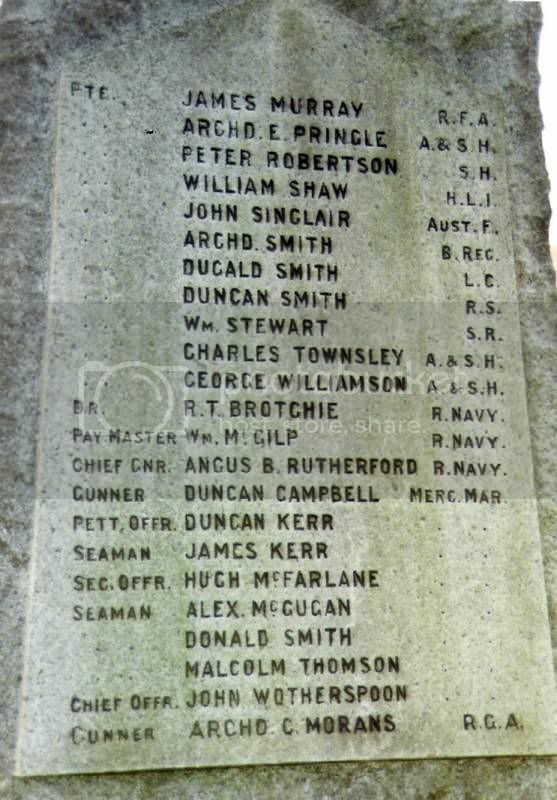 SEAMAN	DONALD SMITH	MERC. MAR. SEAMAN	MALCOLM THOMSON	MERC. MAR. CHIEF OFFR. JOHN WOTHERSPOON	MERC. MAR. GUNNER ARCHD. C. MORANS	R.G.A. 4. WW2 Panel. Poem above dedication inscription then names of fallen in two columns. 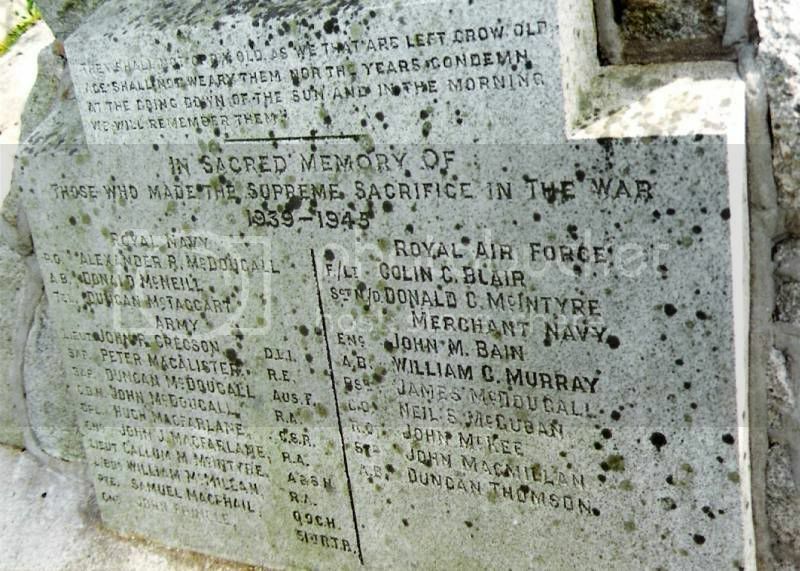 Names arranged by service and possibly date of death as names are not arranged either alphabetically or by rank. Rank, forename, middle initial, surname and, for the army, regiment are given. LIEUT. JOHN R. GREGSON	D.L.I. GNR. JOHN J. MACFARLANE	R.A.
LIEUT. CALLUM M. McINTYRE	A. & S.H. GNR. JOHN PRINGLE	51ST R.T.R. 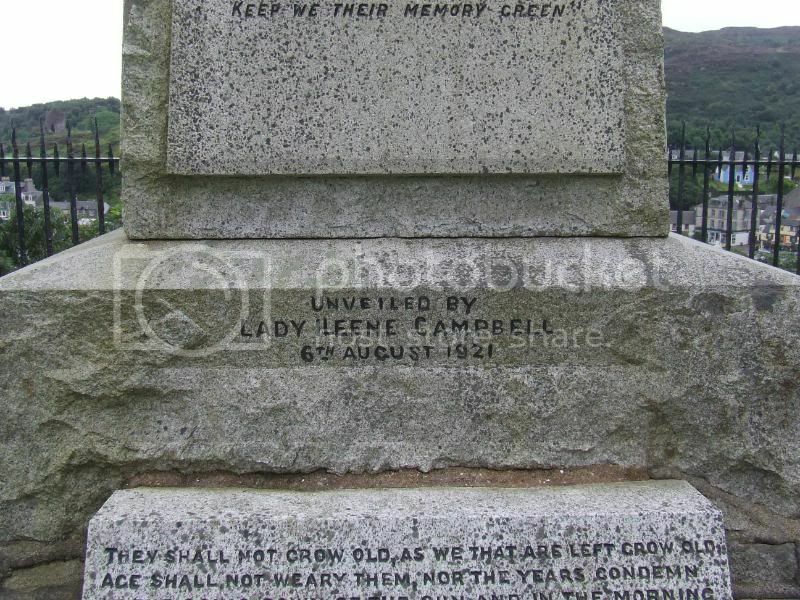 A monument in memory of the 69 men belonging to Tarbert, Loch Fyne, who gave their lives in the war was unveiled on Saturday by Lady Ileene Campbell of Stonefield. The memorial takes the form of a granite column, with a flag winding round three sides. 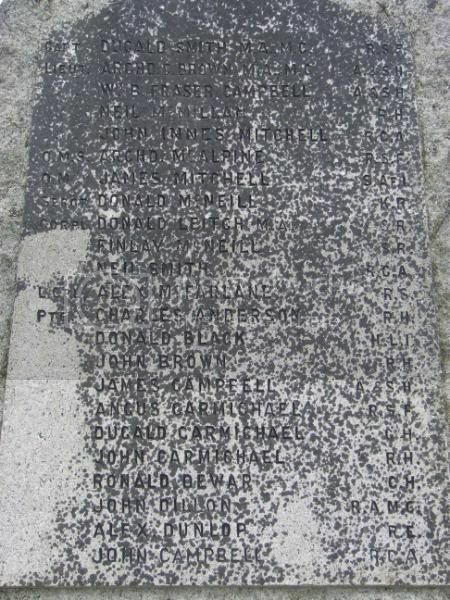 The names of the fallen are carved on the sides of the base, and the column stands on a built foundation. A commanding site has been secured, overlooking the village and the harbour. The dedication service was taken by several local clergymen and an address was given by Captain Evan Campbell of Dunmore, representing friends. After the ceremony wreaths were placed on the monument. "John Carmichael, 9th Black Watch, son of Mr & Mrs John Carmichael, 7 Howat Street, Govan, has been posted missing. He is a native of Tarbert, Lochfyne, and is about 20 years of age. Prior to enlisting in August of last year he was employed in Fairfield Yard, Govan." Regiment/Service: Black Watch (Royal Highlanders) "D" Coy. 9th Bn. Panel Reference: Panel 78 to 83. Additional Information: Son of John Carmichael, of 12, Howat St., Govan, Glasgow. On 26th November 1914 HMS Bulwark, a 15,000 ton battleship, was moored on the River Medway, taking on coal, when an explosion ripped the ship apart. In all, the explosion killed 745 men and 51 officers. Note he is a Royal Fusilier not RSF as on the memorial. He is also listed on the Glasgow University Roll of Honour.